Timber Timbre enchanted me with their 2011 breakout album, Creep On Creepin’ On. Their penchant for darkening vintage American sounds with a deliberate post-punk lacquer broke ground for my audial palate. I internalized its ethos of rural, gothic fantasy and its simple presentation of pop-musical and lyrical themes—punctuated by murky, discordant instrumental dirges. In 2014, Hot Dreams shifted gears into a canyon somewhere between rock n’ roll and country—a plausible soundtrack for North American wanderers. Where the former strutted in a backwater microcosm and the latter traversed through expanses to and from makeshift campsites and one-bar towns, Sincerely, Future Pollution settles into the big city with downtown sounds. It invites us into the band’s next chapter, albeit anxiously. “Velvet Gloves & Spit” opens the album with an uplifting tone similar to their work in Hot Dreams. The track’s opening synth pad carries frontman Taylor Kirk’s yearning croons with the same Hot Dreams gait, as though we have driven to and arrived at our urban destination, still floating on clouds from a road trip and its closing sunset. As “Grifting” ensues next, however, guitar effects and a funky groove take us down a sleepless course into the corners of alleyways between shadowy skyscrapers. 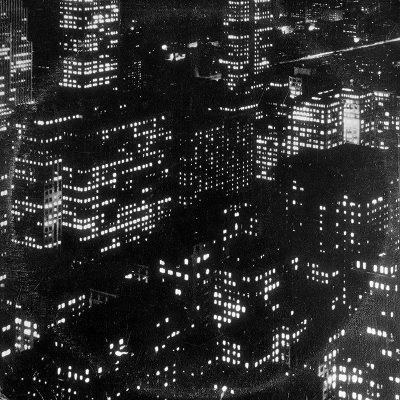 This funk gives us a sniff of Timber Timbre’s new cityslicker swagger. I’ve craved more of the band’s instrumental interludes for six years, and Track 3, “Skin Tone,” scratches the itch, having evolved to electric noir. That’s the only time at which they proffer a true instrumental, but “Bleu Nuit” gets quite close, recalling Creep On Creepin’ On’s thumpy bass, which later sidles into the band’s newfound synth dynamism. The vocoded vocals are what technically demarcate the track as not “purely instrumental,” but the lyrics’ relative indecipherability allow the voice to blend into the track in a smoggy swirl. It’s one of my favorite songs on Sincerely, Future Pollution, as it evinces Timber Timbre’s style and growth equally. Though a handful of wistful, personal-sounding songs populate the album, “Western Questions” gets to the heart of the matter. The song opens with grandeur, and the bass’s groovy comportment imparts sarcasm to Kirk’s words, which eerily detail the worst of Western cultural phenomena. One verse reads: “Stationed agents, operators, slumlords, engineers / Factor in ghettos and stack up the green-paper walls for the ‘Man of the Year’”; and later, “The UFO Land oozing from every screen / Western questions, desperate elections, campaign Halloween.” The title track sonically illustrates the moral squalor leftover from “Western Questions.” A spacey, dirty lead on the keys propels the largely instrumental track to crescendo into Kirk’s eventual description of the extraterrestrial-like atmospheric future that we have in store. These elements of “Western Questions” and “Sincerely, Future Pollution” help to generate a dystopian environment in which the other songs’ narratives operate. The two songs corrode the otherwise expected nature of Sincerely, Future Pollution, and their synergy provides the most impact on the record to make it a successful endeavor overall. The only flaw of Sincerely, Future Pollution, I feel, is the song-to-song equilibrium throughout the album. The continuity feels less fluid than their past two efforts. It also seems that Timber Timbre could flex their muscles on their instruments (besides the synth) just a bit more—the guitar solo on “Moment” rips, though.